Salon season is in full swing in Madrid and one of the best events of the year was last night at the Fundacion Pons. 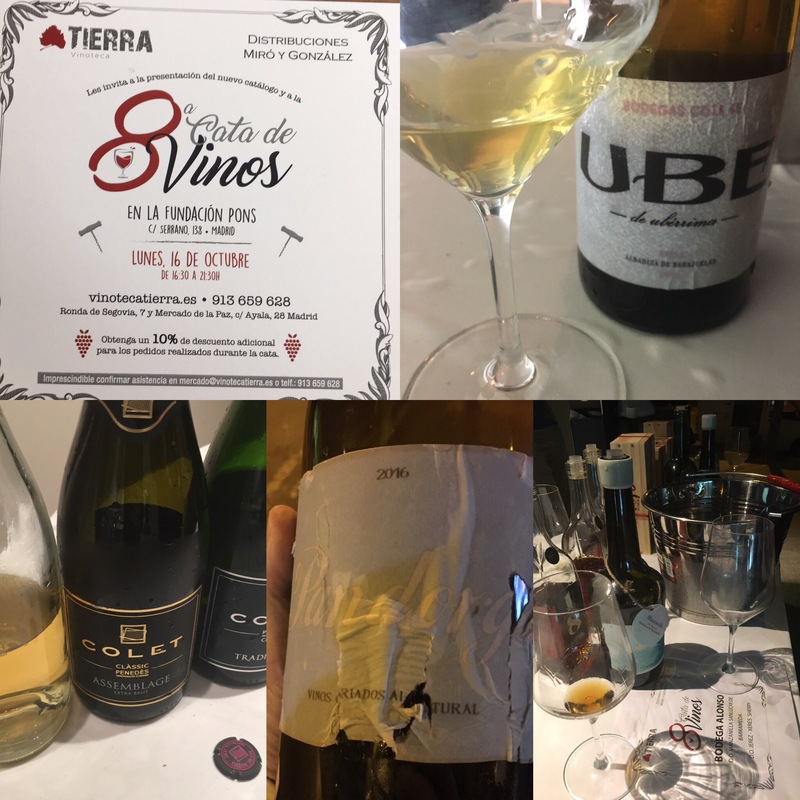 It was the 8th edition of Vinoteca Tierra’s annual tasting of the new catalogue and there were some really cracking wines on show. The sherry action was in the courtyard. Most exciting new release for this blog was a sneak preview of the Pandorga 2016 by Cota 45. It was absolute nectar and only one of two new wines by Ramiro Ibañez, who also brought the incredibly horizontal UBE Maina, said to be very nearly ready for bottling, plus bonus bottles of the Carrascal and Miraflores and even an Encrucijado. Ramiro was, appropriately enough, sharing a table with his mucker Primitivo Collantes and while Primitivo didn’t bring anything new, with wines like the Arroyuelo Fino En Rama and Fossi neither does he need to. To their left was Mario Rovira of Bodegas Akilia. He had a cracking range of earthy but fine natural reds, his Tosca Cerrada and, most interestingly, a buzzy, lively palomino with 16 months in cement. Really good stuff and worth looking out for. And on their other side was Fran Asencio of Bodegas Alonso, with whom I was able to finally catch up after numerous near misses. Worth catching up too because the wines are top drawer – the Velo de Flor I knew all about (which didn’t stop me having some) but it was a great opportunity to try the three oxidated wines. Fascinating to try them together since they couldn’t be more different in character: a smooth and silky palo cortado, an oloroso that is at the same time burnt caramel but light and ethereal and a super fine, super dry amontillado. But most surprising of all – and interesting – was an unfortified palomino with a couple of years in the barrel, on its way to becoming a “Sanlucar vin jaune”. And even then there were more sherries: la Bien Pagá and its mother ship Delgado Zuleta, who were showing off a new amontillado. The only disappointment was that Fernando Angulo of Alba Viticultores didn’t make it. And there were also some excellent wines from other regions inside – the garnachas from Bodegas Ziries, German Blanco and his ranges from Bierzo, Ribera del Duero and Rioja, Olivier Riviere and Viña Zorzal, to name just four of the producers. I had the chance to catch up with Colet, a traditional cava maker that has successfully teamed up with Equipo Navazos for several years – they didn’t have the Colet Navazos with them but you can’t beat some quality bubbles. And, finally, there were also some top quality drinkers around: friendly faces all over the salon, a lot of laughter and as the evening wore on even a few smooches. Absolutely top bombing – may they celebrate many more!